Easy assembly or disassembly—minimal tools. 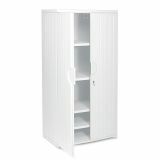 Iceberg OfficeWorks Resin Storage Cabinet, 36w x 22d x 72h, Platinum - Cabinet offers lockable doors for security and double walls for stability. Generous storage capacity holds equipment, books, binders or office supplies. Storage cabinet is made of durable, dent-resistant, scratch-resistant blow-molded, high-density polyethylene. Material is easy to clean and resistant to chemicals. Easily wipes clean with household cleaning supplies.